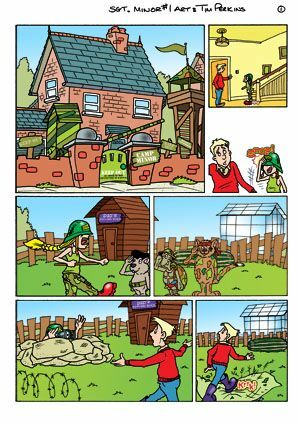 Tim returned to British humour comics when asked to work for the strip inside of Toontastic Publishing's Lucky Bag Comic. 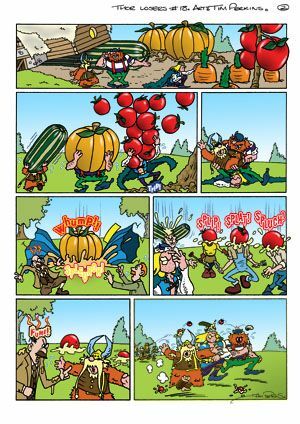 Trevor Metcalfe, the original artist of the strip left Toontastic and Tim was offered the chance to work on it by Editor-in-Chief James Hill, whom Tim had worked with before with James as writer, editor and then later editor-in-chief, early in 2003. The strip was traditionally drawn by Tim in pencil and then inked using black marker pens. 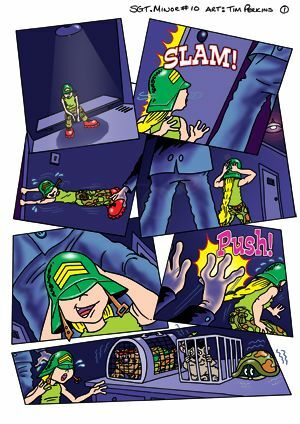 The artwork was then scanned into his SGI computer system and coloured with sound effects also added using Photoshop. 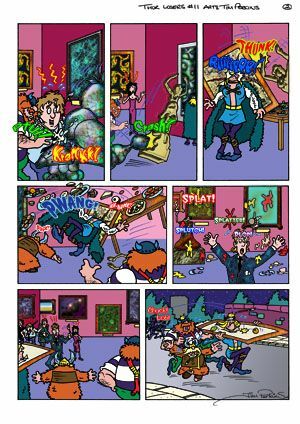 This was the first comic work to receive the digital touch by Tim. Written by Pat Kelleher, a writer well known to Tim and with whom he had worked several times before, the stories were full of puns and slapstick fun and frolics. 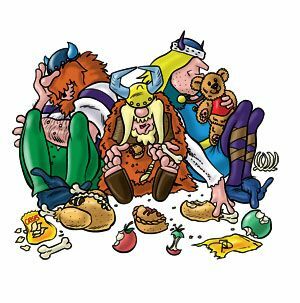 The stories revolved around three characters; Thor, Lars, and Wulf and their pet Guard-Dragon, Fang.The three Vikings are out on a Viking raid one day, when they enter a mysterious fog on the sea and become lost...finding themselves, eventually in the twenty-first century. Out of work and with no money to buy food the three set about with every episode to find work to earn cash...unfortunately that never happens and the ending is always the same. We see the three and their dragon running into the sunset every issue, away from the mischief and mayhem they have caused. 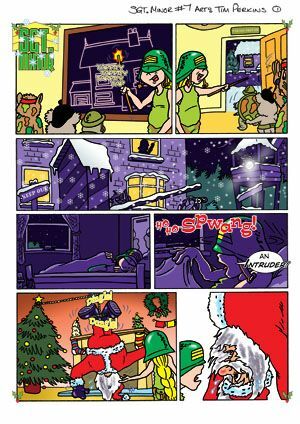 Tim's run on the strip lasted from episode 4 in Lucky bags Comic issue #11 until issue #41 after which the title went reprint only, with issue #42 which signalled the end of the originated comic strips. In the early issues Tim ghosted the style of the original artist, so as the art styles would not be so jarringly different. By the time Tim had designed the new logo for the strip he was drawing completely in his own style, having changed gradually a little more every issue. 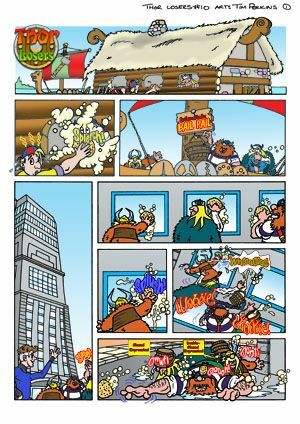 Each issue Pat and Tim would add puns to the strip and in episode 10 Tim used a Fantastic Four pastiche with his 'Reed Richards' look-alike and the 'Baxter Building' (see below). As time went on Tim added more and more background puns to accompany those already in the script from Pat and began using elaborate colouring techniques and the use of styles and filters to the artwork, unlike anything that had been in humour comics to this point. Again this second strip was traditionally drawn by Tim in pencil and then inked using black marker pens. The artwork was likewise scanned into his SGI computer system and coloured with sound effects also added using Photoshop. 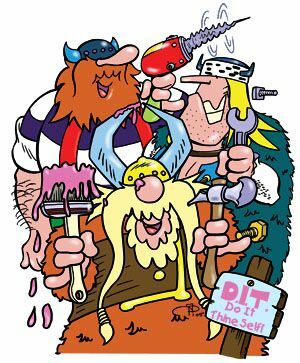 This second strip was again written by Pat Kelleher, and as with Thor Losers the stories were full of puns and slapstick fun and frolics. 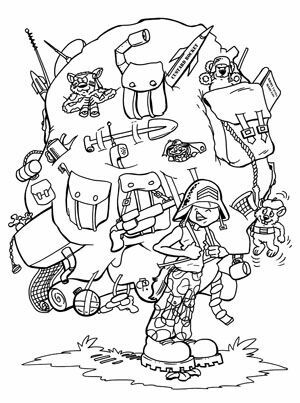 The strip revolved around the adventures of a young girl called Minnie Minor who was obsessed by all things to do with the army. Her home looked like a military base complete with sandbags, barbed wire, check-point guard box, and its very own command lookout post, in the front garden. Her every waking moment took on the appearance of a Rambo film. She had three other "soldiers" in her little army, namely: Commando, the camouflaged cat, Private Hamster, the military Hamster and Tank, the camouflaged Tortoise. Her victims tended to be her long-suffering school teachers, school 'friends' and her Mum and Dad. 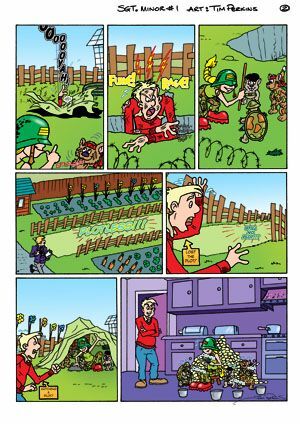 Tim's run on the strip lasted from its first episode in issue# 27 of Lucky Bag Comic until issue # 41 after which the comic went reprint.